J C Dyke Supplies has been in business for over twenty years, supplying building, trade and DIY customers in the English / Welsh border towns, Shropshire and the West Midlands with all of their building requirements. 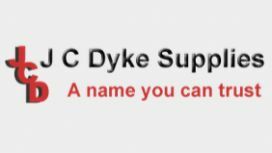 J C Dyke operate from several branches and supply an impressive range of over 10,000 products. They deal with trade and DIY customers and operate both credit accounts and cash sale transactions. Prior to becoming a Benchmark customer they were not using any other software in their sales transaction process. J C Dyke pride themselves on the service they provide their customers. However, as the business expanded and more product lines were added and turnover increased, it became more and more difficult to serve customers quickly and efficiently using their old manual systems. They were also unable to accurately and easily analyse sales trends to help them with stock management and sales promotion. After spending time listening to exactly what the team at J C Dyke wanted to achieve, we were able to supply them with an efficient Point-of-Sale system that incorporated barcode scanning. This revolutionised the way their sales transactions were processed. The system sits on a full accounts package and links seamlessly to their stock records and sales and purchase ledgers. This not only improves the buying experience for customers but gives J C Dyke all of the information they need to produce invoices, orders and quotes quickly, manage credit control and update stock levels without any hassle. As well as supplying software, we were also able to source barcode scanners and receipt printers in order to get them up and running as quickly as possible. Finally we imported all of their stock records so that the transition from manual to electronic point-of-sale was smooth and hassle free. “We were soldiering on with our existing manual sales systems but they were old-fashioned and slow. We knew we needed to update for two reasons – firstly we wanted to speed up the sales process for our customers and underline their perception of us as a modern, forward thinking business. Secondly, as we were growing we needed more information to help us make informed business decisions. We knew we wanted an electronic point-of-sale system and that barcoding was probably the way forward. We started looking around but it’s a bit of a minefield and we were nervous about making the wrong choice. As soon as I spoke with the guys at Benchmark I started to feel more confident that we were doing the right thing. They talked me through the software, let me have a demo to play with and I even spoke to another of their customers. This really helped put my mind at ease. Introducing the new software in to the business was spot-on. I couldn’t fault it. The support team imported all of our records and made sure everything was working properly. It made the whole process simple and worry free. Barcoding has made the biggest impact. It makes sales of multiple items, or things like timber sold by the metre so easy and quick. I would say about 85% of sales are processed immediately, with no delays. This keeps our customers happy! Now I’ve been with Benchmark for a while, one of the best things is that you always speak to the same guys. They know you, your business and how you work. It makes a real difference. We have recently opened a new shop and put the same software system in. We like it when something just works the way we need it to!